“Snowpiercer” (2014). Cast: Chris Evans, Song Kang-ho, Ed Harris, John Hurt, Tilda Swinton, Jamie Bell, Octavia Spencer, Ewen Bremner, Ko Ah-sung, Alison Pill, Vlad Ivanov, Adnan Haskovic, Stephen Park, Marcanthonee Jon Reis, Emma Levie. Director: Bong Joon-ho. Screenplay: Bong Joon-ho and Kelly Masterson. Screen Story: Bong Joon-ho. Graphic Novel: La Transperceneige, Jacques Lob, Benjamin Legrand and Jean-Marc Rochette. Web site. Trailer. It’s been said that there’s no stopping a train. The forward momentum generated by such a potent force is hard to contain, especially when fueled by the power of belief. And it’s even more ironic that a new film drives home this point by way of one of those namesake vehicles. Such is the focus of the thrilling new futurist adventure, “Snowpiercer,” now showing in theaters and on video on demand. When an atmospheric spraying program aimed at curtailing global warming goes terribly awry, the Earth is plunged into an ice age in which everything freezes over, making life on the planet’s surface impossible. In fact, the only survivors of this calamity are the inhabitants of a massive, specially equipped train known as the Snowpiercer, a kind of Noah’s Ark on rails that endlessly circles the globe powered by a perpetual motion engine. Inside the confines of the train, the passengers are safe from the harsh conditions of the external environment, and some might say they’re the lucky ones. But that all depends on which passengers one asks, because not everyone benefits from everything the Snowpiercer has to offer. Just as pre-ice age society was segmented into distinct classes, so, too, is the population of the Snowpiercer. But, with survival on the line and resource management a critical priority, the distinctions between the life-styles of the elite and the underprivileged classes of train society are even more pronounced, and those who are unfortunate enough to be reconciled to the back of the train are kept in line with brutal intimidation tactics. While the privileged few at the front of the train dine on gourmet food and live in elegant compartments, the steerage classes must settle for mass-produced gelatinous protein bars and cramped living conditions, with punishment routinely and harshly doled out to those who dare question their circumstances. It’s enough to spark a revolt, and, after 17 years of such deplorable conditions, that’s precisely what’s about to happen. 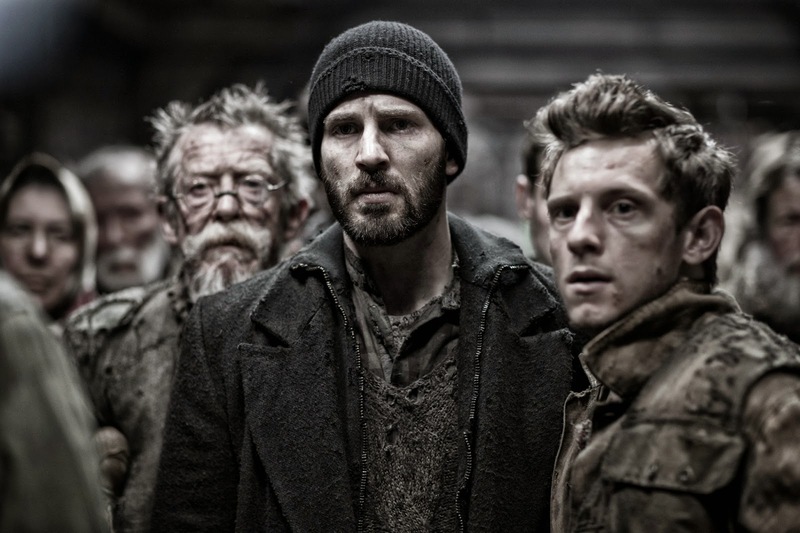 The rigid class segregation of passengers aboard a post-apocalyptic survival train prompts a revolt of the underprivileged against the power elite, led by insurgent leader Curtis (Chris Evans, center) and his compatriots, Edgar (Jamie Bell, right) and Gilliam (John Hurt, left), in the thrilling new action adventure, “Snowpiercer.” Photo courtesy of Radius-TWC. Desperate for change, the residents of the tail section plan to move forward to the front of the train to confront those in control, most notably the Snowpiercer’s creator, Mr. Wilford (Ed Harris). The looming revolt is led by Curtis (Chris Evans), a charismatic freedom fighter, with the aid of his compatriots Edgar (Jamie Bell), Gilliam (John Hurt) and Tanya (Octavia Spencer), who has an added incentive to become involved when her young son, Tim (Marcanthonee Jon Reis), is seized by the authorities without explanation. But, to make their plan work, the rebels must first crack the codes for the locks that keep them trapped in their compartment. And, to accomplish that, they require assistance from the designer of the train’s security system, Namgoong Minsu (Song Kang-ho), whose efforts were rewarded by the powers-that-be with confinement to the Snowpiercer’s prison car. Namgoong agrees to aid the insurgents, but his help comes at a price. In addition to his own freedom, the master locksmith insists that the rebels liberate his psychically gifted daughter, Yona (Ko Ah-sung). And, on top of that, he demands that his assistance be rewarded with doses of kronol, a drug made from chemical waste, a substance almost as volatile as the addiction Namgoong has developed to it. With their team in place, the rebels thus begin their ascent to the front of the train. Their efforts, however, are met with numerous challenges, including resistance from armed guards led by a ruthless commander (Stephen Park), the strong-arm tactics of a pair of sadistic henchmen (Vlad Ivanov, Adnan Haskovic), the platitudinous but menacing threats of one of Wilford’s chief minions, Mason (Tilda Swinton), and even the seemingly benign but decidedly deadly acts of a school teacher to the children of the elite (Alison Pill). But the insurgents’ resolve is so strong that there’s precious little that will hold them back. And, as they make their way forward, they discover an amazing world of wonder aboard the train that they never knew existed (and probably never even envisioned). However, the closer the rebels get to reaching their goal, the more one can’t help but wonder, will they attain it? And, if so, then what? Indeed, what ensues will inevitably surprise everybody, including those both on and off the screen. 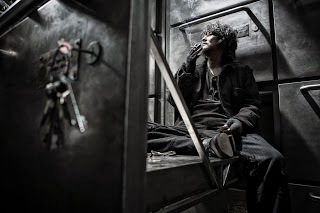 An unjustly imprisoned security system designer, Namgoong Minsu (Song Kang-ho), comes to the aid of a rebel faction seeking to change the deplorable conditions of daily life aboard a post-apocalyptic survival train in director Bong Joon-ho’s “Snowpiercer.” Photo courtesy of Radius-TWC. As anyone who practices conscious creation knows, we manifest the reality we experience through our thoughts, beliefs and intents, and they serve to lead us down a particular line of probable existence, one of an infinite number of possibilities available for expression at any moment. And, given the foregoing, the train provides a fitting metaphor for illustrating how that concept works. The train runs on tracks, following a predetermined “path” created by those who initially conceived of it. It thus symbolically exemplifies the depiction of a specific probability as it transitions from the realm of potential into the world of manifestation – and one that has persisted stubbornly, despite efforts from within to reshape it. Resilience issues aside, the specific probability that the Snowpiercer embodies nevertheless represents a reality sorely in need of change, for a variety of reasons. For example, considering that the train came into existence in response to the onset of the ice age, its emergence signifies a makeshift solution to a larger, more dire challenge, a sort of bandage on a gaping metaphysical wound (and one whose efficacy at treating that injury is questionable at best). What’s more, the Snowpiercer was intentionally set up to mimic the ways of the society out of which it was born, a probability that seeks to perpetuate the inequalities and divisions that kept its citizens apart in the days before the global calamity – only worse. And it all comes at a time when everyone on board should arguably be pulling together for the common good – indeed, the very survival – of the human race. In short, the Snowpiercer is an attempt to prop up the ways of an old world in a new one in which its inhabitants don’t have the luxury of realistically being able to maintain what they once had. It reflects a way of life whose time has come and gone but whose creators desperately attempt to hold onto, a recipe for the imposition of change if there ever were one. 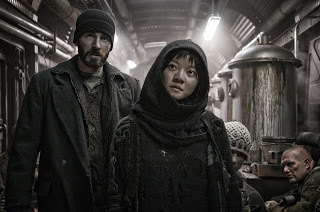 Rebel leader Curtis (Chris Evans, left) attempts to orchestrate a rebellion to improve living conditions aboard a post-apocalyptic survival train with a ragtag band of followers, including a young psychic girl, Yona (Ko Ah-sung, right), in “Snowpiercer.” Photo courtesy of Radius-TWC. In that sense, then, the Snowpiercer represents an affront to one of the key concepts of conscious creation, namely, that we’re continually evolving, that we’re all in a constant state of becoming. If the old way of life were meant to die away in the wake of the ice age, its attempted perpetuation through the Snowpiercer is a futile effort to stave off what the masses have collectively created (not to mention what must inevitably happen). The efforts of Wilford and his cohorts to preserve their way of life is thus a sort of metaphysical obscenity, one that seeks to deny the forces of our inherent nature. But artificially maintaining the status quo is unlikely to withstand the tremendous power of impending change, for the beliefs driving the wave of revolution and transformation are far more potent than any of the weapons supposedly designed to oppose it. And, when those forces of change are let loose, they might well unleash powers no one ever imagined, with outcomes exceeding anything that anyone ever saw coming. In addition to the changes that the rebels seek to invoke for their society at large, they also bring about changes within themselves. The vision they hold for what could be prompts them to push past their own personal limitations. It drives them to stretch, to become more than they could have imagined. But, given the evolutionary nature of conscious creation, that shouldn’t come as any surprise, either. Whether that principle is applied on a macro or micro level, one thing is certain – it ultimately won’t be denied. Mason (Tilda Swinton, center), a perfunctory minion of the power elite aboard a post-apocalyptic survival train, does battle with a band of rebels led by Curtis (Chris Evans, left) and his compatriot Tanya (Octavia Spencer, right) in their efforts to improve the living conditions of the underprivileged in director Bong Joon-ho’s incredible cinematic thrill ride, “Snowpiercer.” Photo courtesy of Radius-TWC. “Snowpiercer” is an incredible thrill ride, to say the least, one of the most innovative films to come out in a very long time. It serves up a storyline all its own, yet it also contains elements reminiscent of a number of other familiar offerings, including Battlestar Gallactica, the “Mad Max” movie franchise, and films like “2012” (2009), “The Hunger Games” (2012) and even “The Truman Show” (1998). The picture features great special effects and action sequences, but it doesn’t rely on them to carry the narrative. It also includes ample humor, along with a host of terrific performances, particularly by Swinton, Spencer, Harris and Pill. In approaching this film, it’s crucial that viewers suspend belief regarding the story since it’s clearly implausible on many levels. However, if you consider the plot metaphorically, you’ll enjoy it immensely. Sensitive viewers should be aware that the film is quite violent at times, but its imagery is never gratuitous, thanks to director Bong Joon-ho’s successful implementation of Hitchcock’s rule of showing the aftermath (but not the actual occurrence) of disturbing events. The picture probably could have benefited from a little editing during the first 30 minutes, which drag a bit in spots, but, once the film gets past that point, it takes off like a shot and never looks back – nor disappoints. The sudden appearance of a worldwide ice age would undoubtedly be a disaster of Biblical proportions. But, as the Good Book also states in Ecclesiastes 3, “to every thing there is a season,” including all of the probabilities that are ultimately made manifest. “Snowpiercer” serves as a valuable reminder of this wisdom, of knowing when to let go when the time comes to do so. Seeing our plans getting derailed may come as a shock or disappointment, but the doors that open as a result may also hold tremendous promise for fresh new beginnings that bring us – all of us – blessings beyond what we can comprehend.